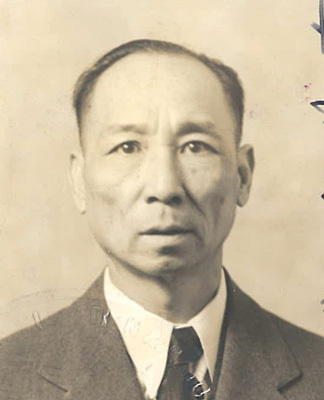 Lee Gang Bong 李境垹 arrived at the Port of Seattle on 1 January 1940 and was admitted as the son of a native, Lee Fook Loy, deceased. 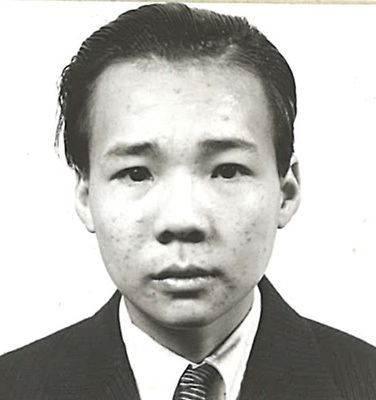 He was 17 years old, born 30 March 1923, and he was coming to live with his brother, Lee Chong Yin 李長恩, in Rock Springs, Wyoming. “Lee Gang Bong, M143 photo, ”ca. 1940, Chinese Exclusion Act case files, RG 85, National Archives-Seattle, Lee Gang Bong file, Seattle Box 803, 7030/12660. His father, Lee Fook Loy, returned to China in November 1935 and died there in 1937 after a brief illness. “Lee Fook Loy, Form 430 photo, ”ca. 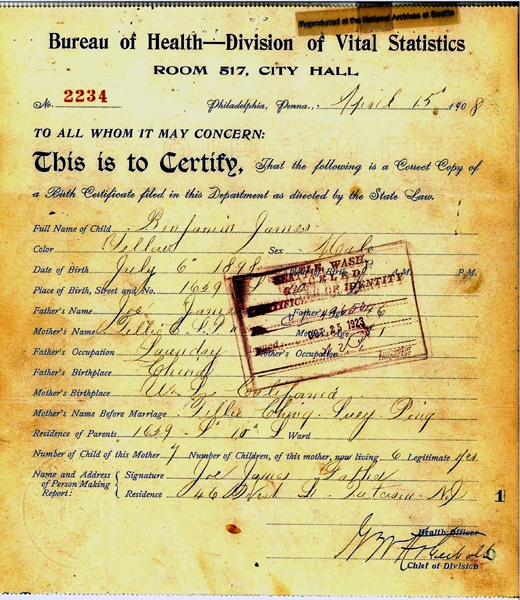 1935, Chinese Exclusion Act case files, RG 85, National Archives-Seattle, Lee Gang Bong file, Seattle Box 803, 7030/12660. 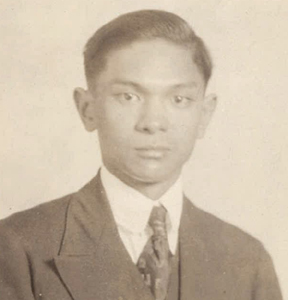 Lee Gang Bong married Louie Shee in China against his wishes on 15 June 1938 when he was fifteen years old. His mother wanted someone to wait on her and she also thought he should be married before he came to the United States. According to Lee Gang Bong’s interrogation his home village of Pon Lung in the Sui Low section of Toy San, China had 30 or 40 houses arranged in 11 rows facing west. His brick house had five rooms and tile floors with stone in the court. Each bedroom had two outside windows with on glass but fitted with iron bars and wooden shutters. They had a rice mill. Three wooden carved ancestral tablets painted green with gilt character representing their general ancestors were hanging on the back wall of the shrine loft in the living room. The village had a brick wall about five feet high on the head side and bamboo running from the back to the tail with a pond in front. 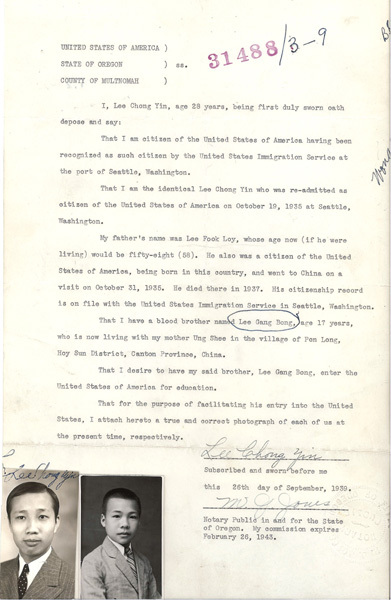 “Lee Chong Yin Affidavit,” 1939, Chinese Exclusion Act case files, RG 85, National Archives-Seattle, Lee Gang Bong file, Seattle Box 803, 7030/12660. Upon his arrival at the Port of Seattle, Lee Gang Bong’s brother, Lee Chong Yin, was a witness for him. His interrogator asked him confrontational questions, such as: “Do you know of any American Chinese citizen that ever had a daughter born in China?” and “Insofar as you know are all children born to American citizen Chinese in China sons?” Chong Yin married Leow Shee and had a three-year old son in China whom he had never seen. 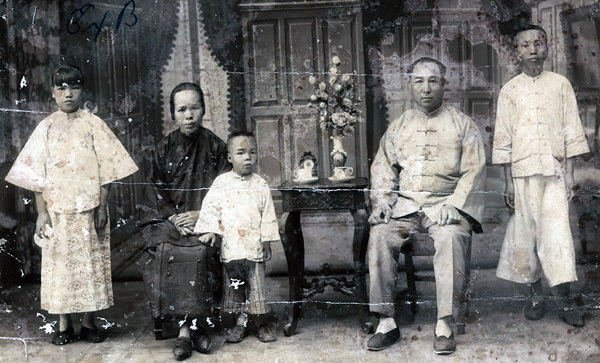 He was born after Chong Yin returned to the U.S.
“Lee Gang Bong, family portraits,” ca. 1927, 1930, Chinese Exclusion Act case files, RG 85, National Archives-Seattle, Lee Gang Bong file, Seattle Box 803, 7030/12660. Lee Gang Bong was admitted at the Port of Seattle on 9 February 1940. Benjamin James was born 6 July 1898 in Philadelphia, Pennsylvania to Joe and Tillie James. 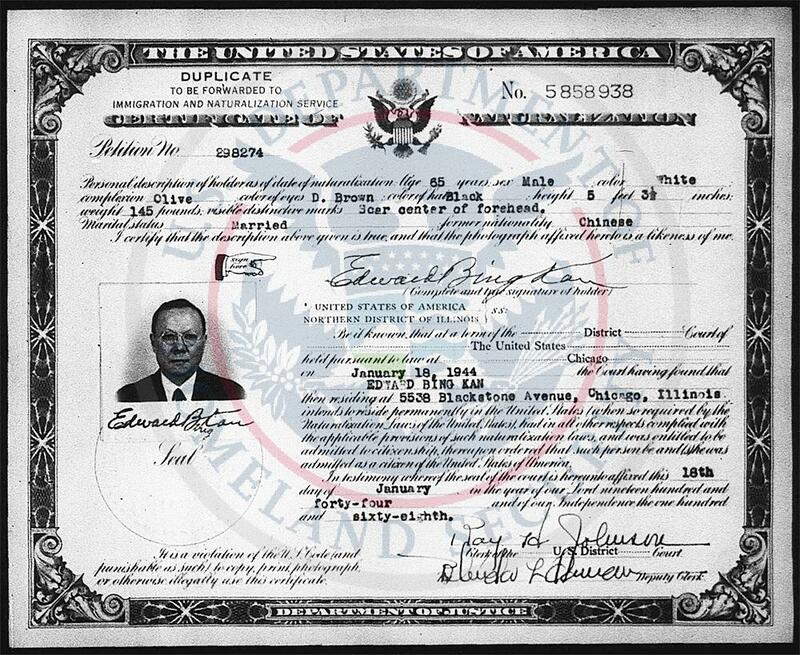 His birth certificate was presented to immigration in 1911 as proof of his U.S. citizenship before the family left for China. Instead of inte rviewing each of the children individually only Benjamin’s parents were interviewed before they left the U.S. in 1911. Joseph James’ Chinese name was Chu Gee Cim [Gim] and his married named was Chu Chuck. He was born in Ling Yung village, Sun Ning, China about 1852 and came to the U.S. through San Francisco in 1868. He stayed there about eleven years working as a merchant and sometimes a laborer then went to New York City until 1880. He lived in Atlantic City, New Jersey; Pittsburgh, Pennsylvania; New York, New York; and Paterson, New Jersey. 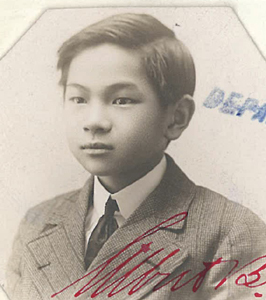 He was in Atlantic City in 1894 when he registered as required by the Chinese Exclusion Act and obtained his merchant’s papers. He married Chung Suey Ping, (English married name: Tillie James). She was born in California. They had three sons and five living daughters and a daughter, Sou Ying, who died at age four. Their children, all born in the United States, were Lillie James (Mrs. Lee), Mamie James (Mrs. Bing), Harry James, Annie James, Margaret James, Benjamin James, Alice James, and Arthur James. 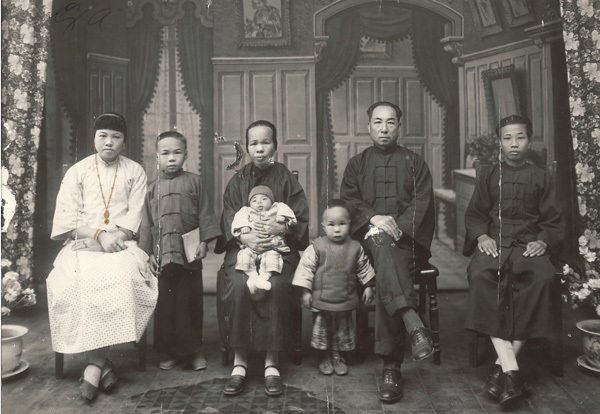 In 1911 the older children stayed in the U.S. and Joseph and Tillie took Harry, Benjamin, Alice and Arthur to China so they could attend school there. 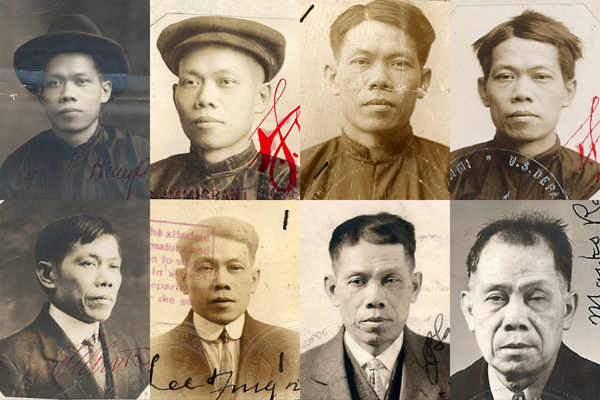 “Benjamin James, form 430 M143 photos,” 1911 & 1923, Chinese Exclusion Act case files, RG 85, National Archives-Seattle, Benjamin James file, Seattle Box 109, 734/2-1. In 1923 Benjamin James informed Immigration that he would be returning to the U.S. via Seattle in the near future. He gave the immigration officer three photos for his certificate of identity and asked that the certificate be sent to him in San Francisco. In January 1924, writing on stationery from Washman Co., importers and Exporters at 259 Fifth Avenue in New York City, he requested that the certificate be sent to the Washman address. His Certificate of Identity #49650 was forwarded to him there.